The MTAC Spare Kydex bodies are a rigid material that are fit to each firearm and maintains their shape even with the pistol un-holstered. The smooth low friction surface allows for a fast draw and easy one-handed re-holstering of the firearm. The Kydex body will not bend or stretch over time and is impervious to sweat and solvents. IMPORTANT NOTICE! We no longer offer Kydex Bodies for Generation 1 leather backings. If your MTAC was purchased between April to September of 2010, please read below. The Generation 2 backing was introduced in April of 2010 and fully implemented in September 2010. If your MTAC was purchased before April 2010, you have a Gen1 MTAC. The Gen1 sweat shield measures at 1.75”"-2" across. The Gen2 has a wider sweat shield that measures 2.25" across. Great holster shell! Fit my G48 perfect. Will work into my holster rotation for this gun. Excellent Quality, excellent service, excellent product over all. Been using my Minotaur holder for over 15 years. After trying at least half a dozen alternatives I found the "Minotaur" (Think it is now called the "MTAC") This is the first and only holster that fits me perfectly. This is the 3rd time I’ve ordered a spare body/shell for my Comp-Tac holster. Always the perfect fit and quality. Fast shipping also. Thanks! I now have 4 different holster bodies for the Comp-Tac MTAC Holster. The initial combination for my Sig P365 fit so well and was so comfortable that I had to try it out for my other/medium small frame pistols. The ease of converting the holster to fit other models keeps the cost down as I check out the ease of use with other guns. 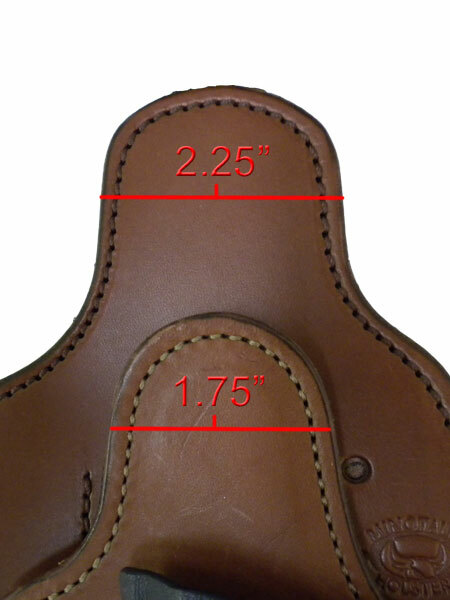 The combination leather frame and pistol body fits well in the 4 o'clock position and there is virtually no printing. Not a big fan of the large gap/space along the barrel/slide. I also have a Cacalry holster for my LC9 and body fits the contour of the gun much better. I still like the comfort of the MTAC better than the Cavalry.